As you may or may not know, the Sunrise Park District requested our club contribute $30,000 toward the construction of the new pickleball courts. We were able to secure a $10,000 grant from the County which left $20,000 for SPC to raise. We started our fund raising campaign in the last quarter of 2018, which consisted of membership dues, donations from members and non-members, a GoFundMe campaign, a Skills & Drills clinic, and several other fund raising activities. Thanks to your loyal membership and donations, we just recently met our $20,000 goal. Everyone deserves a huge thank you from the SPC board and the park district board. When you see other members out on the courts be sure to thank them also for their support and generosity. Everyone has contributed to the success of this campaign. Soon we will have 6 additional new courts creating the premier outdoor pickleball facility in the Sacramento area. The plan is to build 6 courts similar to the 6 existing courts giving us a total of 12 courts. For now, the stadium court previously planned is being postponed until a later date. The Sunrise Recreation and Park District Board had their board meeting on March 21 and the new courts were on the agenda. Jake, Lee, Amy and a few club members all spoke on our behalf and did a great job. The park district board unanimously approved the new courts construction so it is now official. We do not know at this time when construction will begin. Special thanks to Jake, Todd, and Dave of the Sunrise Recreation & Park District for their hard work in getting these new courts approved and built. Skills & Drills Event a Huge Success! On Sunday, January 27th the club held its first ever Skills & Drills event. We filled to capacity with 36 players, each donating $25 or more, raising a total of $1,000 for the new courts fund! Our call for volunteers was also enthusiastically answered by a dream team of 15 advanced level players from the club. We had beautiful weather and a great atmosphere of happy pickleballers. Each of the 6 courts was set up as a different drill station - serves, returns, third shots, volleys, dinks, and lobs. Participants formed groups of 6 and moved through each station, spending 15 minutes learning and practicing their skills, and 10 minutes competing for points in fun mini-games. Custom-designed, pickleball-themed vinyl decals (which you'll surely starting seeing on lucky members' cars, water bottles, and paddles) were awarded as prizes. THANK YOU to everyone who made this event happen, especially Mo Nard for spending countless hours behind the scenes planning this event. We were blown away by our fantastic team of volunteers, who somehow managed to feed hundreds of balls over 3 hours with smiles on their faces, while providing some great coaching tips. You all make our club better, in more ways than one! Sunrise Pickleball Club now has 401 members for 2018! The club Board Of Directors(BOD) thanks everyone for your tremendous support over the last couple of years. Without your support we would not be able to provide the round robins that are free to members, the shade screen along the East fence, and the court resurfacing that was completed in 2018, etc. We hope you continue to support the club in 2019 as we have some exciting things planned for next year. As many of you know, the big plan for 2019 is to build 5 new courts next to the existing 6 courts. The current plan is for 4 courts similar to the 6 we now have along with 1 stadium court with bleacher seating. All 5 new courts will be north/south facing like the current 6. Also, if funds can be secured, we would like to move the net posts on the existing 6 courts so they are 12 inches from the sideline instead of the current 20 inches. 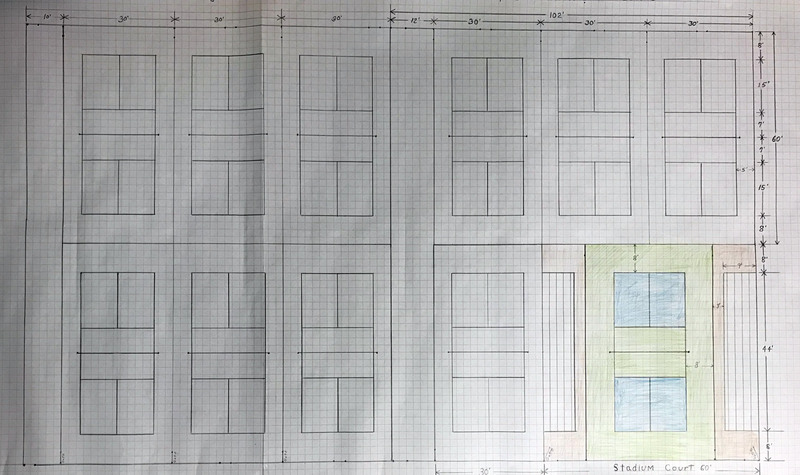 Click here to see a drawing of the proposed new courts. Building the courts is not cheap but the board has a plan to raise the $20,000 to go along with the $10,000 county grant money. Below are some of the steps planned or in progress to raise the needed $30,000. Grant Money - Lee Swayne, Steve Cooper, and Jake Polito worked long and hard on a proposal to Sacramento County for a non profit grant. Lee heard recently from County Supervisor Sue Frost that the club will be getting a county grant of $10,000 to help build the courts. But we have to use it or lose it by September of next year. Fund Raising - We have several new board members who will be leading the club next year. Amy, Gail, and Sheri have many fund raising ideas that you will be hearing about during the coming year. One was hosting a club snack bar at the last Fall Classic tournament sponsored by SRPD. Close to $1,000 was raised and they plan to do the same at all the future tournaments at Rusch Park. They have other exciting fund raising events in the planning stage. If you would like to help out with fundraising efforts please reach out to any board member or send an email to the club's email address. Donations - We are counting on the donations to provide a significant portion of the needed new court funds. Donations can be made via check, GoFundMe, or PayPal (credit or debit card). For more details on how to donate directly to the new courts fund, please click here. LifeTime Memberships - At the last club board meeting it was decided to offer SPC lifetime memberships for $500 per membership. You will be a club member forever and never have to pay a yearly dues again. These will be available starting in 2019. Club Dues - At the last membership meeting, members unanimously voted to support an increase in yearly dues for 2019 only to $50 to help raise money for the new courts. On Oct 5, the club board voted to increase the yearly membership dues for 2019 to $50 per individual and also eliminate the family membership. Member's children under 18 can play for free and must be accompanied by an adult during club hours. These changes will take effect on Jan 1, 2019. Sunrise Park District - In addition to some financial help, the Sunrise Park District will provide much of the labor to construct the new courts as they did for the 6 existing courts. To clarify something that has come up several times recently, the instructional clinics conducted at Rusch Park by Doug Koch and other out of the area instructors are not connected to our club in any way. The Sunrise Park District rents out the courts for these events and they receive all the money generated by these events. The park district also sponsors the Fall Classic and Spring Smash tournaments and they receive all the money from these events. However, your club will be running the snack bar at these tournaments in the future and will receive any profits generated. We continue to collect many items left at the courts. Clothing, water bottles, and chairs, etc. Be sure to place your name and phone number on all your items you bring to the courts so we can contact you. If you do leave something at the courts, go to our club website and click on "Contact" to send us an email describing the item you left behind. Thank you for your continued support of the Sunrise Pickleball Club and see you on the courts! As many of you know, our club has been working diligently to raise funds for our new courts. Thanks to Jake, Steve, and Lee, we have secured a grant that will help greatly in reaching our goal. However, we are not there yet. We will continue our fundraising efforts through snack bars, round robins, etc., business as usual, but, we have also set up a Gofundme account. For those of you not familiar with Gofundme, it's a very simple, streamlined way to donate to a cause. Our cause is to get those darn courts built! Membership is growing in leaps and bounds and we will need more courts in the very near future. So we're hoping we can count on the generosity of our members to help get us there. Although we would be forever grateful for your contribution, this is strictly a voluntary donation and not mandatory in any way. To donate through Gofundme, just click on any link and it will walk you through the process of choosing your donation amount and payment information. We also have the option to donate via PayPal using your credit or debit card. Any contribution, small or large, would be very much appreciated and every dollar gets us that much closer to our four brand new courts and grand stadium! So please, invest in your club, community and health, together we can get this done. Also, please share our Gofundme link with family, friends and on social media, thanks everyone and see you on the courts! A special thank you to Paddletek for donating some awesome Bantam TS-5 paddles as our Round Robin Raffles grand prizes this month! We have now raised $1395 for the Gene Ahner Scholarship Fund, which provides financial assistance to qualifying families so their kids can participate in the many programs offered through the Sunrise Recreation & Park District. Bob Hansen and Larry Hawe were the lucky winners! Thanks to Amber Lao as well for securing these donations for us, and all the members who bought raffle tickets.